Home » Blog » Why Is My A/C Blowing Out White Smoke? 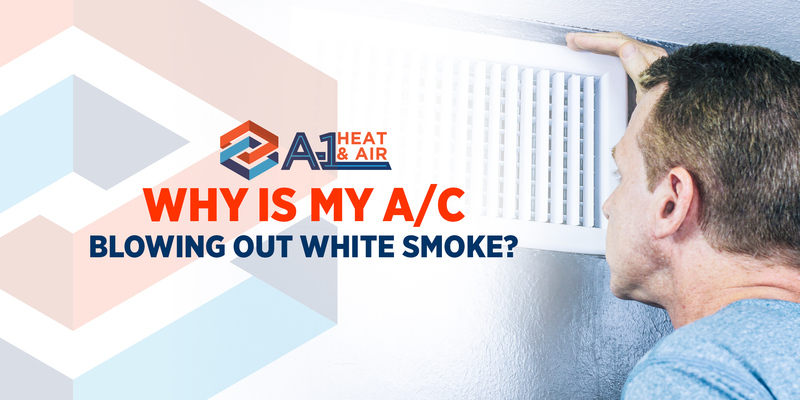 Have you noticed a white smoke blowing out of your A/C unit? You probably checked your air conditioner for burnt or short circuit wires. But, you didn’t see anything wrong. Where exactly could this white smoke come from? Here are two (2) possible reasons for white smoke in your air conditioner. The odorless, white steam or smoke coming out of your air conditioner is probably excess water stored in the heater box. Commonly, it is a sign of a restricted drain hole that needs cleaning. The steam or vapor collected during the process of condensation could have made its way out when the air hit it. If this is the case, you should check with your HVAC contractor about the situation. Once they find out that the smoke is because of the accumulated water in the drain hole, the only thing is to do is to pump the water out. As for the homeowner, make sure that the drain pipe is clear of water or anything that can block proper airflow. When the cold air hits the warm air, white smoke or fog can develop. If the unit’s temperature is below its dew point, water vapor and moisture are formed. Then, they condense in the air as water droplets producing the smoke or fog. Keep the air filters clean at all times. Run your A/C fan on high speed to cool your indoor air a lot faster. Schedule a regular A/C inspection. Is the White Smoke Odorless? You are absolutely safe if the steam is odorless because it’s possibly just a humidity or condensation issue. But, if it smells like burnt wire caused by mechanical corrosion or something, then you could have big trouble. If you notice something goes wrong with your air conditioner and you are not sure what’s happening, the best thing to do is to call A-1 Heat and Air Conditioning for a solution. We are your local HVAC contractor in Orlando, Florida that you can always ask for help. Call us to schedule an appointment.